Chicago Factory Index Improves - Manufacturing activity improved in the Chicago region in June after a disappointing drop in the prior month. The Chicago purchasing managers index rose to 39.9% in June from 34.9% in May, according to a survey of corporate purchasing managers released Tuesday. The Chicago PMI is considered a leading indicator to the national Institute for Supply Management (ISM) manufacturers' survey to be released Wednesday. The increase in June brings the Chicago PMI in line with other regional surveys. Last month, the Chicago index had fallen more than other regions. Analysts blamed the drop on auto sector weakness. Economists expect a further improvement in the national ISM index in June. US Home Prices Down in April, But Decline Slowing - On a month-to-month basis, prices in 20 selected cities fell 0.6% in April, with declines in 11 cities, compared with a decline of 2.2% in March. The overall annual pace of decline has slowed, said David Blitzer, chairman of the index committee for Standard & Poor's, which compiles the Case-Shiller index. "Thirteen of the 20 metro areas also saw improvement in their annual return compared to that of March. Furthermore, every metro area, except for Charlotte, recorded an improvement in monthly returns over March," Blitzer said in a statement. "While one month's data cannot determine if a turnaround has begun; it seems that some stabilization may be appearing in some of the regions." Consumer Confidence Falls - A reading on U.S. consumer confidence relapsed in June, falling to 49.3 from a slightly downwardly revised 54.8 in May, as worries grew about jobs and the economy, the Conference Board reported Tuesday. Following a large confidence jump in May, consumers grew more pessimistic in June. Government to Retain Current Stake in AIG - AIG CEO Edward Liddy said Tuesday that he's been given no assurances that the government's 78.9% stake in the troubled insurance giant will ever change. Liddy was responding to a shareholder who suggested during the company's annual meeting that a lower government stake could increase the value of the business. As AIG makes progress in its overall re-organization, a lower government stake might be discussed, Liddy added. AIG is more stable than it was a few months ago, Liddy said earlier in the meeting. The insurer is planning a reverse stock split which is scheduled to take effect later on Tuesday. Treasurys, Dollar Gain on Chinese Comments - The dollar and Treasurys gained support after People's Bank of China Governor Zhou Xiaochuan said Sunday that "our forex reserve policy is always quite stable" and that "there are not any sudden changes," according to Dow Jones Newswires. This comes on the heels of the publicized comments that China wished to have a "super currency" to replace the dollar. Madoff Receives 150 Years - A federal judge on Monday sentenced admitted multi-billion dollar swindler Bernard Madoff to 150 years in prison, according to published reports. Madoff's lawyers had sought a sentence of 12 years. In March, Madoff pleaded guilty to 11 felony charges, including securities fraud, money laundering, and theft from an employee-benefit plan. His clients have reportedly lost more than $13 billion. Oil, Energy Sector Rally - Oil rose back above $70 per barrel on continued problems in Nigeria and a broad rally in the equity markets. Based on the oil news, the energy sector rallied. Gold Drops, Copper Rises - On the news out of China, the dollar gained against foreign currencies which sent gold lower by about 0.5%. When the dollar is strong, gold loses its appeal as a hedge against it. When the dollar is soft, gold gains. Also, copper gained as inventories fell. As infrastructure and home building pick up, copper generally rises since it is used in a variety of materials. A Unified Bank Regulator Is a Good Start - By Jamie Dimon, Chairman and CEO J.P. Morgan Chase & Co. - The Wall Street Journal - "With clear signs of stability returning to the U.S. financial system, this is an appropriate time to look ahead to the rebuilding process and to the steps that must be taken to prevent the recurrence of another such crisis. The restoration of our financial system to health does not give anyone the permission to return to 'business as usual.'" On the Road to Regulation - The New York Times - "The Obama administration’s financial regulatory reform proposal has had an inauspicious start. First, lawmakers from both parties gave it a lukewarm reception in the Senate Banking Committee when it was released nearly two weeks ago. The House Financial Services committee has postponed its hearings until after the July recess." Obama and 'Regulatory Capture' - By Thomas Frank - The Wall Street Journal - "The reason why those who see economic regulations as akin to tyranny often win policy debates is because they have a fiery argument with visceral appeal. Those who try to sell the virtues of the supervisory state tend to favor the passive voice. They don't do fire. They do law review. The situation ought to be the reverse today. We have just come through the most wrenching financial disaster in decades, brought about in no small part by either the absence of federal regulation or the amazing indifference of the regulators." A little over a year ago we started The Rollins Financial Blog, and with this post, we will now have more than 400 posts. The number of daily readers has grown over that time, and the e-mails, comments, and discussions that have come from posts on a wide array of subjects have been interesting to say the least. Our format has changed a little with several people enjoying the "Quick Notes" covering various subjects with brief descriptions. One reader said that they loved the "Points of View" because they enjoyed being able to bring up certain ideas and articles at parties and appear well read (happy to help). Finally, we can certainly not forget the writings of Joe Rollins when discussing the blog. From the stories of his childhood and life to the economic discussions, we have received numerous e-mails, phone calls, and comments about his posts. It is nice to see that so many of you enjoy the blog, and we look forward to continuing along the same track. If you have a comment or suggestion, you can e-mail us by either replying to the daily e-mail or sending an e-mail to rschultz@rollinfinancial.com. Thanks for being part of year one of The Rollins Financial Blog. Madoff's Wife to Relinquish Claim to Assets - The wife of Bernard Madoff has agreed to relinquish her claim to more than $80 million worth of assets and will retain just $2.5 million in cash following an agreement reached with federal prosecutors late Friday, according to a report in The Wall Street Journal. Bernard Madoff is scheduled to be sentenced by District Court Judge Denny Chin in New York on Monday. House Passes Cap and Trade Energy Bill - What is being touted as a victory for President Obama, House lawmakers approved an energy bill on Friday that would set tough new greenhouse-gas emissions standards for U.S. companies and mandate more use of renewable energy sources. The vote was a razor thin 219 to 212. Obama argues that the bill will create jobs through new energy investments but critics say it will be a punishing tax on companies and consumers. The core of the bill is the "cap and trade" system for limiting emissions in which companies would buy and sell permits to meet emissions limits. How Much Cap-and-Trade Bill Would Cost Families - By Catherine Rampell - Econmix Blog from The New York Times - "The costs of new energy infrastructure and purchases of carbon allowances would not, for the most part, be borne by American businesses themselves. Rather, the office says, companies would probably pass on most of those costs to customers — in particular, American households — in the form of higher prices." Cap and Trade Doesn't Work - By Martin Livermore - The Wall Street Journal - "Advocates of the system like it because 'the polluter pays.' Setting aside for the moment the question of whether it is justifiable to call carbon dioxide a pollutant, companies of course do not simply absorb these extra costs. Instead, they pass them on to their customers who are also, by and large, taxpayers. Not only does the taxpayer carry the cost of any cap and trade scheme, but their money also provides profit for a whole new industry: the new carbon trading sector, the middlemen who make the system work." The Climate Change Climate Change - By Kimberley A. Strassel - The Wall Street Journal - "Among the many reasons President Barack Obama and the Democratic majority are so intent on quickly jamming a cap-and-trade system through Congress is because the global warming tide is again shifting." U.S. Incomes Up on One-Time Stimulus Payments - The Commerce Department reported Friday morning that personal incomes jumped 1.4% in May due to one-time $250 payments to Social Security beneficiaries as part of the stimulus program. Consumer spending rose 0.3% in nominal terms. The results were in line with the consensus of estimates. With the boost to incomes, the savings rate rose to 6.9%. Excluding the one-time payments, disposable incomes rose 0.2%, the government said. Wages and salaries fell 0.1%. Real consumer spending (adjusted for inflation) rose 0.2%. Russia Eyes Possible Bank Bailout Plans - Russia is considering taking stakes in troubled domestic banks in a potential move to deal with bad assets in its financial system, the Financial Times reported on Friday, citing a draft proposal. Under this proposal, the Russian government would issue OFZ Treasury bills to bolster the balance sheets of the biggest banks and in return it would receive preferred shares, the report said. The government would also take board seats and have veto rights, the FT reported. China Calls Again for a Super Currency - On Friday, China's central bank repeated its assertion that a new global reserve currency is needed. "To prevent the deficiencies in the main reserve currency, there's a need to create a new currency that's de-linked from the economies of the issuers," the People's Bank of China said in its annual financial stability review, according to a report by Bloomberg News. Japan Orders Citibank Japan to Suspend Operations for One Month - Japanese financial regulators sanctioned Citigroup Japanese unit Friday for the second time in five years, demanding it suspend some of its retail-business operations because of inadequate controls in place to prevent money laundering. Citibank Japan was ordered to suspend sales activities, including advertising, at its retail businesses, from July 15 to Aug. 14. The suspension doesn't restrict transactions initiated by customers and doesn't apply to the company's corporate-banking division. China Moves to Block Hummer Sale - Chinese authorities have moved to block the sale of General Motors' Hummer brand to a Chinese company, the BBC reported, citing Chinese state radio. The sale to Sichuan Tengzhong Heavy Industries had been announced earlier this month as part of GM's recovery plan. Chinese authorities cited environmental concerns and Sichuan Tengzhong's inexperience in building automobiles in moving to block the sale, the BBC reported. Bernanke on the Capitol Hill - On Wednesday, Fed Chairman Ben Bernanke was in the midst of a FOMC meeting when Rep. Darrell Issa (R-CA) started releasing information that essentially said Bernanke had engaged in a "cover-up" to disguise his actions in strong-arming the merger of Bank of America and Merrill Lynch last fall. After the FOMC meeting, the Fed stated that it had acted with integrity throughout the process. Today, Bernanke goes before the House Oversight and Government Committee to be questioned by its members including Issa and Rep. Dennis Kucinich (D-OH) - who believes the Fed was completely within its rights and did nothing wrong. "I believe that the Federal Reserve acted with the highest integrity throughout its discussions with Bank of America regarding that company's acquisition of Merrill Lynch," Bernanke said in a prepared testimony for today. Q1 GDP's Final Number Revised Lower Again - The final tally for the 1st Quarter 2009 GDP was released by the Commerce Department on Thursday morning. With a contraction of 5.5%, the economy had a horrible six month period between October 1, 2008 and March 31, 2009. In April, the initial GDP estimate was for -6.1%, then it was revised to -5.7% in May, and finally to -5.5% today. Most economists are forecasting that the 2nd Quarter GDP (which ends June 30) will contract at 1.5% annualized and 3rd Quarter GDP (ends September 30) will grow 1.3%. Jobless Claims Rise - The Labor Department first-time claims for state unemployment benefits rose 15,000 to 627,000 to it's highest level since mid-May. There is a good reason for this rise that is usually overlooked in most years. For those that do not know, some states allow bus drivers and cafeteria workers to file for unemployment during the summer school break since they are 10 month employees instead of 12-month employees. This gives those employees a "paycheck" for two months plus while not accruing more pension benefits. BofA to Exceed Fed's Capital Requirement - Bank of America on Thursday said it will exceed the $33.9 billion capital buffer set by the Federal Reserve through stock offerings, debt offerings, conversions of some preferred shares, and other measures. In total, BofA will have raised more than $38 billion ($4.1 billion) more than necessary more than 4 months earlier than the November 9 deadline set by the Fed. The bank has said it will now focus on repaying the TARP to exit the government program. Durable Goods Orders on the Rise Again - A Commerce Department report showed a better than estimated 1.8% increase in May on durable goods orders (estimates had been for a 0.5% decrease). Better orders for airplanes and machinery was a positive that helped fuel the increase. A narrower gauge of business investment marked its best increase in more than four years. It was the third increase in the past four months for durable-goods orders. The 1.8% increase followed an identical gain in April. BOE - Asset Purchases Are Positive - Preliminary evidence indicates the Bank of England's quantitative easing program is beginning to have a positive impact, BOE Gov. Mervyn King told a parliamentary committee Wednesday. "The program began only three months ago, so there are few indications of its effects. The little evidence that we do have, though, seems to be positive," King said, pointing to a pickup in broad money growth and indications the BOE's asset purchases have helped encourage private issuance in credit markets. Fed Statement to Focus on Later - There are numerous analysts saying that today's FOMC statement from the Fed is likely to focus on holding interest rates at the current level for the foreseeable future. The basic premise is that the Fed does not want to step to quickly, and they wish to put at ease worries by investors and consumers that rates are going to rise soon. The "exit strategy" that everyone has been asking about will take time to form, but the Fed and Treasury both seem to want to take a wait and see approach before reacting. Bernanke and Geithner have both said they want to make sure the recovery is in full swing before making any real changes. New Home Sales Fall 0.6% in May - Sales of new homes were essentially unchanged near record-low levels in May as home builders continued to slash their inventories of unsold homes, the Commerce Department estimated Wednesday. Sales dropped 0.6% to a seasonally adjusted annual rate of 342,000 in May from a revised 344,000 in April. The report was weaker than the 363,000 pace expected. Inventories of unsold homes fell 2.3% in May to 292,000. The median sales prices fell 3.4% compared with a year earlier. FDIC Eyes Extension to Unlimited Deposit Insurance - The FDIC on Tuesday proposed extending a program that provides unlimited deposit insurance for non-interest-bearing deposits by six months. The coverage was set to expire Dec. 31, 2009, but the agency extended it to June 30, 2010, seeking to calm fears of large businesses that have significant business customers that keep large deposit accounts at banks for their payrolls. The agency provided a temporary blanket deposit insurance coverage for non-interest-bearing accounts last year as the financial crisis worsened. Home Prices Decline 0.1% in April - According to a report from the Federal Housing Finance Agency, U.S. home prices fell 0.1% in April and declined 6.8% in the past year. Out of nine regions, prices fell in five, and rose in four. For March, the decline was revised down to 1.4%, from a prior estimate of a 1.1% drop. May Existing Home Sales Report - Falling prices boosted sales of pre-owned homes in May to the highest level since October, the National Association of Realtors estimated Tuesday. Existing-home sales rose 2.4% to a seasonally adjusted annual rate of 4.77 million, the trade group said. Sales have risen in three of the past four months, and are down 3.6% in the past year. The median sales price fell 16.8% in the past year to $173,000. Inventories of unsold homes fell 3.5% to 3.80 million, representing a 9.6-month supply at the May sales pace. Apple Sells More Than 1 Million New iPhones - Apple said Monday that it has sold more than 1 million iPhone 3GS models through Sunday, just three days after the phone's launch. Some 6 million customers have downloaded the new iPhone 3.0 software in the product's first five days, Apple said. In a statement, CEO Steve Jobs said the iPhone's momentum is "stronger than ever." The newest iPhone, which runs twice as fast as its predecessor, offers a 3-megapixel camera, the ability to capture video and other features such as new voice controls for making calls and playing music. Treasurys Up on Fed Buys, World Bank Outlook - Treasury prices were higher Monday which pushed yields lower as the Federal Reserve was in the process of its continuing purchase of bonds. Also, a negative economic outlook from World Bank was creating a "flight to quality" to Treasurys which helped push the prices higher. The Fed is expected to purchase Treasurys maturing between 2026 and 2039. The previous purchases for this maturity range have been for $3.5 billion and $2.5 billion. The buyback is part of the Fed's continuing effort to keep borrowing costs low including mortgage rates. Dollar Stronger, Gold, Oil Fall - As part of the "flight to quality" after the World Bank outlook, the dollar and yen moved higher against the euro. The dollar is still seen as the most secure currency in the world. Gold fell Monday to $923, the lowest level in one month, as falling oil prices and a stronger U.S. dollar reduced the precious metal's appeal as a hedge against inflation and a weaker currency. Crude oil fell below $68 a barrel Monday, the weakest in nearly two weeks. In other metals, platinum fell 1.6%, palladium 1.9%, silver sank 2.8%, and copper fell 3%. Dollar Down, Gold, Silver, Oil Up - As the dollar declined primarily due to increasing optimism in the global equity markets, gold and silver moved higher. The dollar has been caught in a trading range between $1.37 - $1.40 on the euro recently. Gold and silver were positive today, but they are still down for the week, and this would be the third week in a row that they are negative (the longest losing streak in two months). Gold and silver are normally seen as a hedge to the dollar, so the day's move was expected. Oil is higher Friday by about 0.5% as news of a pipeline explosion by Nigerian rebels helped push the commodity higher. Contributing to the gain though was a release by the World Bank where they raised the 2009 growth forecast for China, the world's second largest consumer of oil. The news came on the heels of a study that showed China's oil demand increased in May for a second month. "Quadruple Witching" Pushes Stocks Today - Quadruple witching is the term for equity options, index options, single-stock futures and index futures expiring simultaneously. In the past, it has brought on additional volatility (and helped push the market higher), but some analysts are saying that they believe most of the moves were made early this week. Stanford Indicted On Fraud Charge - Financier R. Allen Stanford was indicted on federal fraud and obstruction charges, according to media reports Friday. The Justice Department is expected to announce charges against Stanford and other Stanford Financial Group executives for defrauding investors of billions of dollars in an alleged Ponzi scheme. *** Note - Look for a new post by Joe Rollins tomorrow regarding healthcare. Recession Is Losing Steam - The U.S. recession is "losing steam" and a slow recovery should begin by the end of the year, the Conference Board said Thursday as it announced that the index of leading economic indicators rose 1.2% in May, the second straight increase. Seven of the 10 indicators improved in May, the board said. The leading index is up 1.2% in the past six months, the first increase since April 2007. The coincident index fell 0.2% in May, "but the declines are less intense," said Ken Goldstein, an economist for the organization. Continuing Jobless Claims Fall By 148,000 - The Labor Department on Thursday morning reported that continuing jobless claims fell by 148,000 to 6.68 million during the week ending June 6. It was the lowest since May 9. Initial claims, meanwhile, rose by 3,000 to 608,000. The four-week average of continuing claims rose by 2,250 to 6.75 million. The insured unemployment rate fell to 5.0%. Mortgage Rates Fall - On the news that inflation is not rearing its ugly head, mortgage rates across the board fell. Typically, as inflation fears creep in, mortgage rates rise in expectation. The benchmark 30-year fixed-rate mortgage averaged 5.38% in Freddie Mac's weekly survey, down from 5.59% a week ago. That erased most of the big jump from a week earlier, when rates shot up from 5.29%. The 30-year is still well below its year-ago levels, when the national average rate on the loan was 6.42%. The 15-year fixed-rate mortgage averaged 4.89%, down from 5.06%. A year ago the 15-year averaged 6.02%. Clean Energy - Nuclear Plant in Ohio - Any news when it comes to clean energy has been good news, and as discussed previously in this blog, nuclear energy (and natural gas) should be a part of a plan to reduce dependence on fossil fuels. The announcement on Thursday by Ohio Governor Ted Strickland, Duke Energy, Areva, USEC, and UniStar Nuclear Energy that they had formed an alliance to build a nuclear power plant at a U.S. Department of Energy site in Piketon, Ohio should be considered progress. Dubbed as "The Southern Ohio Clean Energy Park Alliance," the partnership will evaluate the site as a potential location for a new nuclear power plant. The clean energy park comes after a DOE effort to convert former weapons sites for energy production. CPI Edges Up 0.1% - The consumer price index (CPI) increased a seasonally adjusted 0.1% in May as higher gasoline prices were largely offset by falling food prices, the Labor Department reported Wednesday. It was the first increase in the CPI in three months. The core CPI - which excludes often-volatile food and energy prices -- also rose a seasonally adjusted 0.1% in May. The CPI has fallen 1.3% in the past year, the sharpest decline in prices since April 1950. BB&T To Pay TARP Back - BB&T said Wednesday it will pay about $3.1 billion to the Treasury to repurchase its preferred stock, plus a final dividend payment of about $13.9 million, to exit the TARP. BB&T has also notified the Treasury that it will buy back the outstanding warrant associated with TARP, which allows the Treasury to purchase up to 13.9 million shares of the company's common stock. "Any adjustment resulting from the repurchase of the outstanding warrant will be accounted for in the second or third quarter of 2009," said the financial holding company in a statement. BB&T has paid a total of $92.7 million in dividends under TARP. Obama Wants Fed to Reform Financial Rules - President Obama will formally propose on Wednesday a plan that would empower the Federal Reserve and make it the supervisor of large, systemically vital financial institutions, granting it the authority to be a lender of last resort in "unusual and exigent circumstances," to mega-banks if the department first receives approval from the Treasury Department. Based on a preliminary plan released Tuesday, large financial institutions will need to have greater capital on hand (comparable to the current needs addressed in the "stress tests" versus the prior "Tier 1" capital required) and will be scrutinized more thoroughly by The Federal Reserve. The proposal will reach the Senate and House on Wednesday with an approximate timeline of year end for the plan to have passed and been enacted. There are several other proposals within the plan, but the Federal Reserve change seems to be the most far reaching. IBM Looking at Mobile Communications - On Wednesday morning, IBM announced that it plans to spend $100 million over the next five years to advance mobile services and capabilities for businesses and consumers worldwide. IBM is focusing on services to the millions of people who have bypassed using a PC as their primary method of accessing the Internet and instead use their mobile devices. Scotts Mircale-Gro Raises Forecast - Signals Change By the Consumer? - This is a bit of a strange company to report on in the Rollins Financial Blog, but the news was quite interesting. Scotts Miracle-Gro lifted its earnings forecast for fiscal 2009 on Wednesday, citing strong consumer demand in the U.S. The group said it now expects to report adjusted earnings of $2.35 to $2.45 a share, compared to a previous forecast of $2.10 to $2.30 a share. The company said consumer purchases of its products in the U.S. were up 17% for the fiscal year to date, as measured by point-of-sale data from its largest retail partners. The reason this is important to note is how consumers are still taking care of their lawns and gardens. A 17% increase in sales shows a somewhat significant shift from having a service handle lawn chemicals to doing it yourself (no way to determine how many individuals are now mowing their lawn). While the number of gardens in the US may have increased, this increase could not have come from that alone. This would most likely point to a small way in which the consumer is saving money. Just an interesting tidbit. PPI Rises 0.2% - The producer price index (PPI) rose 0.2% in May, after seasonal adjustments, with higher energy prices offsetting a drop in food prices, according to the Labor Department. The core PPI, which excludes food and energy prices, fell 0.1%. Despite the tick up in May, the PPI has dropped 5% in the past year, the biggest year-over-year decline since August 1949, the government said. This could be seen as a deflationary spiral, but the core producer price index has gained 3% over the past year. May Housing Starts Rise 17% - U.S. housing starts rebounded nicely in May, rising 17.2% to a seasonally adjusted annual rate of 532,000 after plunging 12.9% in April to a postwar low, the Commerce Department estimated Tuesday. The surprising increase was led by a 62% gain in new construction of multifamily dwellings. Starts of single-family homes rose 7.5% to a 401,000 rate, the highest since November. Building permits rose 4% in May to a seasonally adjusted annual rate of 518,000. Permits for single-family homes rose 7.9% to a 408,000 annual rate, the highest since November. Industrial Production Falls 1.1% - U.S. industrial output fell 1.1% in May, led by big drops in motor vehicles, mining and high-technology products, the Federal Reserve reported Tuesday. Output is down 13.4% in the past year, the largest year-over-year decline since 1946. In manufacturing, capacity utilization fell to a record-low 65%. Morgan Stanley to Repay TARP - Morgan Stanley is expected on Wednesday to begin repaying billions of dollars in bailout funds received from the U.S. Treasury, CNBC reported Tuesday, citing an unidentified person familiar with the situation. Last week Morgan Stanley said it was among ten major banks which would be allowed to repay loans they received from the TARP. The firm received $10 billion under the program. Fed Purchases $6.45 Billion of Treasurys - The Federal Reserve Bank bought $6.45 billion in Treasurys maturing between 2012 and 2103 Tuesday morning, the first of two operations this week. Dealers offered $31.316 billion to be purchased. Traders expected the central bank to buy between $6 billion and $7 billion, in line with past purchases in this maturity range. The buyback is the latest in the central bank's attempts to keep a lid on borrowing costs, though mortgage rates have jumped significantly in the last few weeks in spite of the Fed's efforts. After the buyback, Treasurys stayed lower, pressured by better-than-expected inflation and housing starts data. Moral Hazard and the Crisis - Paul A. Volcker to a meeting of the International Institute of Finance in Beijing, June 11 - The Wall Street Journal - "Volcker: Hedge funds don't need to be regulated like banks." You Be Obama - By David Brooks - The New York Times - "Let’s say that you are President Obama. You’ve inherited a health care system that is the insane spawn of a team of evil geniuses from an alien power. Pay is divorced from performance. Users are separated from costs. Rising costs threaten to destroy your nation and everything you hold dear." A plan to boost America’s fiscal health - By Peter Orszag, Director of the White House Office of Management and Budget - Financial Times - "As the healthcare debate picks up in the US, there has been much discussion about how to pay for it. Coinciding with this debate are vocal concerns about the country’s underlying fiscal position – which some have suggested as a reason to delay healthcare reform." 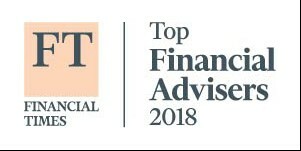 *** Note - If FT.com asks you to register, you can do so for free. G8 Finance Ministers Meet - The Group of Eight (G8) finance ministers met on Saturday. During the meeting, they started discussions on how to unwind the fiscal and monetary policy measures undertaken in response to the financial and economic crisis that spread last year. The finance ministers met to the lay the groundwork for the G8 meeting of the heads of state in July. Pointing to a recovery in stock markets, rising consumer and business confidence and improvement in financial markets, the group "discussed the need to prepare appropriate strategies for unwinding the extraordinary policy measures taken to respond to the crisis once the recovery is assured," the finance ministers said in a statement. "These 'exit strategies', which may vary from country to country, are essential to promote a sustainable recovery over the long term," they said. Treasury Secretary Tim Geithner and IMF chief Dominique Strauss-Kahn both stressed the need to ensure a recovery had taken hold before pulling back on global efforts to lift the economy, according to The Wall Street Journal. Geithner has said over the last few months that altering policies that boost the US economy (and global economy for that matter) too early will cause far more harm than good and slow the economic recovery. Banco Santander SA Looks to Expand in the US - According to Spain's Expansion newspaper, Banco Santander SA (an international Spanish bank) plans to make acquisitions in the U.S. within the next five years, mirroring its U.K. expansion strategy, quoting Chief Executive Alfredo Saenz. Santander is the euro zone's largest bank by market value and has also purchased three financial institutions in the U.K. during the past five years. Saenz was quoted as saying in an interview that Santander is targeting markets in New York, Massachusetts and Pennsylvania following last year's full takeover of U.S.-based Sovereign Bank. To give a brief background on Santander (from its website), "Founded in Northern Spain in 1857, Santander has a successful history in retail and commercial banking, and has grown to become one of the five largest banks in the world by profit." You can learn more about Santander by clicking on this link that discusses Santander and Sovereign Bank. Six Flags Files for Bankruptcy - Six Flags, the amusement park chain, filed for bankruptcy protection on Saturday and is seeking an expedited approval from the court of its pre-negotiated reorganization plan. The Chapter 11 filing will have no impact on the day-to-day operations of its 20 parks in the U.S., Mexico and Canada, the company said. "This process is strictly a financial restructuring of our debt," Chief Executive Mark Shapiro said in a statement. "The current management team inherited a $2.4 billion debt load that cannot be sustained, particularly in these challenging financial markets." OPEC Raises Oil Production Again - OPEC said Friday its May production rose for a second month, as member countries pumped more oil following a sharp rally in oil prices. OPEC said in a monthly report that its May output averaged 28.27 million barrels a day, up 135,000 barrels a day from a month ago. The OPEC reference basket price, a benchmark price for oil delivered by the group, surged nearly 14% to average $56.98 a barrel in May. OPEC also said 2009 global demand is expected to drop 1.6 million barrels a day from a year ago, a forecast that's unchanged from their previous estimate made a month ago. With OPEC controlling about 1/3 of all oil production in the world, they obviously play an important role in setting the price based on supply/demand. Over the past year, they have been criticized for taking advantage of the dramatic run up in oil prices with the peak of nearly $150 a barrel last year. At that time, nearly all member nations were producing at capacity due to the high demand and price. After oil started to drop substantially due to the reduced demand, OPEC tried (sometimes unsuccessfully) to reduce the production output from the member nations. Smaller nations wanting to keep the influx of cash flowing continued high production levels even at reduced prices. Eventually, OPEC sought to enforce production quotas to essentially put a floor in the oil market. OPEC said that they wanted to stabilize the market, and the way to accomplish this goal was by production quotas. One of the main issues is that if oil prices continue to rise, this could slowdown the progress of the global economic recovery that has been seen thus far. OPEC is quite honestly in a precarious position. They have a product that is widely needed to "fuel" a recovery, but if they take too much advantage of that position, they become the ones hampering the recovery. If this happens, they will continue to look like the bad guy. Consumer Sentiment Rises - U.S. consumer sentiment rose in June, but remained at relatively low levels, according to a survey by the University of Michigan and Reuters. The consumer sentiment index rose to 69 in mid-June from 68.7 in May. The index hit a 28-year low of 55.3 in November, and has averaged 88.2 over the last 10 years. Recent readings have been boosted by consumers' expectations that the end of the recession is approaching. BlackRock Buys BGI from Barclays' - Reduced Worries About Barclays' Capital - BlackRock late Thursday agreed to buy Barclays' BGI unit (Barclays Global Investors) in a $13.5 billion cash-and-shares deal. The deal will make BlackRock the world's largest asset manager, and Barclays will receive $6.6 billion in cash and 37.8 million shares of BlackRock. The deal trumps an earlier agreement for Barclays to sell just the iShares exchange-traded-funds business of BGI to private equity group CVC Capital and will give the U.K. bank a 19.9% stake in the enlarged business, to be called BlackRock Global Investors. Analysts generally agreed the deal is positive for Barclays because it helps relieve worries over the group's capital position, although it will reduce earnings at least in the short-term. From BlackRock's point of view, the deal is likely to generate significant cost savings, though analysts added the sheer scale of its funds under management could hurt its ability to capital on some investments. Treasurys Up After Consumer Sentiment - Treasury prices remained higher Friday, pushing yields down, after a report on consumer sentiment showed Americans' outlook improved. Yields on 10-year notes declined 6 basis points to 3.80%. Treasurys were higher in earlier trading amid signals that overseas investors are still comfortable buying Treasurys. Do not miss the last item under today's notes regarding BofA CEO Ken Lewis. Initial Jobless Claims Fall - The number of first-time claims for state unemployment benefits fell 24,000 to 601,000 in the week ended June 6, the Labor Department reported Thursday. The four-week average of initial claims fell 10,500 to 621,750. In the week ended May 30, continuing claims for benefits reached a new record high, rising 59,000 to 6.82 million from an upwardly revised level in the prior week. Continuing claims have set fresh record highs for 19 consecutive weeks. The four-week average of these continuing claims rose 57,250 to a record 6.75 million. Retail Sales Rise - U.S. sales at retail stores increased 0.5% in May, but much of the seasonally adjusted increase reflected higher gasoline prices, the Commerce Department estimated Thursday. Sales rose for just the fourth time in the past 12 months. Compared with last May, sales are down 9.6%, reflecting the huge contraction in consumer spending as the recession tightened its grip. The 0.5% increase in May was less than the 0.7% forecast by economists, but upward revisions to March and April put total sales receipts in May close to expectations. Sales fell 1.2% in March and 0.2% in April. Gasoline sales jumped 3.6% in May, a function of higher prices at the pump. Motor vehicle sales rose 0.5% in May. Household Wealth Drops - The net worth of U.S. households fell by $1.3 trillion in the first quarter, a seventh straight decline that has seen their wealth drop by nearly $14 trillion, the Federal Reserve reported Thursday. Household net worth fell at a 9.9% annual rate in the first three months of the year to $50.4 billion, the lowest in more than four years. U.S. families have lost 22% of their wealth since the peak. On the bright side, households and businesses reduced their outstanding debt during the quarter. Total private-sector debt fell at a 0.4% annual pace, the first time that private-sector debt had declined since the Fed's records begin in 1952. *** Note - The debt being lowered is not really a surprise after seeing the dramatic turn in the savings rate over the last 6 months. This is just a continuation of that trend. Also, the decline in the stock market and housing market also would have led to a negative wealth report. BofA CEO Ken Lewis on Capitol Hill - Bank of America's CEO Ken Lewis appeared before a House subcommittee this morning to give testimony and answer questions regarding the Bank of America/Merrill Lynch merger. His prepared statement (you can view it here) outlines his time at BofA, BofA as a company, the acquisitions of CountryWide and Merrill Lynch, the reasons behind acquiring Merrill Lynch, and finally the issues around the completion of the Merrill Lynch deal. The question and answer period is still ongoing, and by his statements, it does seem that BofA was pressured. "During the December standoff between the big bank and top government officials, Federal Reserve Chairman Ben Bernanke dismissed the pullout threat as a 'bargaining chip.' Fed attorneys called the bank's arguments 'not credible.' And a top examiner said Chief Executive Kenneth Lewis's own claim that the bank was surprised by Merrill's mounting losses 'seems somewhat suspect.'" "A transcript of the documents, assembled by congressional investigators and reviewed by Dow Jones Newswires, indicates Mr. Bernanke was willing to threaten Mr. Lewis's removal." "Mr. Bernanke related that Mr. Lewis raised the possibility the bank could face shareholder lawsuits for proceeding with the deal, given the deterioration in Merrill's finances. "I don't think that's very likely and said so," Mr. Bernanke wrote, referring to potential lawsuits." Treasurys & Interest Rates in the News - Treasury prices stabilized Wednesday after Federal Reserve Bank of Richmond President Jeffrey Lacker reiterated The Fed's resolve to fight inflation. He also said the government's stimulus plans are not really boosting growth. Meanwhile, Russia's central bank plans to cut the proportion of U.S. Treasurys in its foreign exchange reserves based on media reports citing the bank's First Deputy Chairman Alexei Ulyukayev. Ulyukayev said that Russia would switch some of its reserves into bonds issued by the International Monetary Fund (IMF), according to the reports. In late May, the IMF's managing director said in a statement that Russia intends to invest up to $10 billion in the first-ever notes to be issued by the fund. As of late May, Russia's international reserves stood at $401.1 billion, the third biggest in the world. In Europe, ECB Governing Council member Axel Weber said central banks may need to raise interest rates before inflation risks appear in order to choke off potential dangers during a a speech in Frankfurt. "The symmetrical approach to monetary policy demands that risks linked to faster money and credit growth, booming asset markets -- particularly a boom on the real estate market -- and low risk premia, need to be confronted decisively," said Weber, who also heads the German Bundesbank, according to Dow Jones Newswires. Weber said his comments shouldn't be seen in the context of the ECB's current monetary policy stance. *** Note - The ECB's focus is only on inflation, and this past Fall they were heavily criticized for not lowering rates. At the time, they continued to focus solely on inflationary pressures. Home Depot - "The worst of the correction is behind us..." - Home Depot raised its full year profit forecasts on Wednesday. CEO Frank Blake said at the company's analyst and investor conference Wednesday that the "worst of the correction is behind us" in the housing market. Home Depot had previously forecast profit to be down 7%, and readjusted its forecast to flat to down 7%. The improved forecast was based on merchandising, operational changes, and sales that will still be down year over year, but at a better rate than previously expected. Chrysler Deal Final - Chrysler Group LLC said Wednesday that it has finalized its global strategic alliance with Italian auto maker Fiat. The deal will see Fiat provide Chrysler with technology, platforms and powertrains for small- and medium-sized cars, as well as Fiat's international distribution network, especially in Latin America and Russia. Fiat named its chief executive, Sergio Marchionne, as the new Chrysler CEO. After coming through bankruptcy court, Chrysler is now 20% owned by Fiat, 55% by its workers' union, 8% by the U.S. government and 2% by Canada. Fiat's share could rise to 35% depending on certain milestones, though it can't obtain a majority stake until all taxpayer funds are repaid. Gasoline Prices Slightly Higher - According to the AAA Daily Fuel Guage Report, the average retail price for a gallon of unleaded gasoline in the U.S. climbed a penny to $2.63 a gallon on Wednesday and $0.08 higher than a week ago. Gasoline sold for $2.55 a gallon a week ago and $2.23 a gallon a month ago. A year ago, gasoline cost an average of $4.04 a gallon. Trade Gap Widens Slightly for April - The trade deficit widened by 2.2% in April to $29.2 billion, the Commerce Department said Wednesday. Exports fell faster than imports in January. Exports are now at their lowest level since July 2006 while imports have sunk to their lowest level since September 2004. Through the first four months of this year, the trade deficit was $120.4 billion, down significantly from $244.8 billion over the same period last year. The U.S. trade deficit with China narrowed to $16.75 billion in compared with $20.30 billion in the same month last year. Even in the avalanche of bad news regarding nearly everything concerning the financial world that we have read over the last 12 months, the stock market has recently continued to make a slow but steady rebound. In the first full week of June, the stock market (as measured by the Standard & Poor’s Index of 500 Stocks) had another excellent week. This index was up 2.3% for the week, bringing their year-to-date gains to 5.4%. Given how bad the market was down in January and February of 2009, it is nothing short of stunning to see the reversal that has occurred over the last three months. It certainly would not surprise me to see somewhat of a pull back sometime soon given how quickly the market has gone up; but clearly the trend is higher, not lower. There are a few items that piqued my interest over the weekend that I wanted to share with you. The Washington Post itemized all of the banks that are ready and able to pay back their so-called “bailout” money. It was even more interesting to read about all of the road blocks the Federal government has put up to keep these banks from repaying their debts. In that regard, reflecting on what actually took place is appropriate. In September of 2008, Henry Paulson, who was the Treasury Secretary at that time, called in 10 of the largest banks in the United States and basically strong-armed them into accepting Federal stimulus money. Many of the banks openly expressed that they didn’t need or want a bailout, and would rather the government keep its money. However, Paulson insisted that they all take it so that no single bank would be thought by Americans to be weak. Each and every bank was to take their appropriate stimulus money and pay the government 5% in non-taxed, deductible dividends. In addition, the banks were to give warrants to the government to buy additional stock of their banks, whether the banks wanted to or not. Each of the banks dutifully did the right thing for America (at that time) and took the money with the clear understanding that they could repay it as soon as their financial condition strengthened. The Washington Post now reports that at least eight to 10 of these banks have been begging the government for some time to take the money off their hands. There may be as much as $100 billion repaid to the government in the next few weeks. The government has thrown up every possible roadblock to keep from accepting this money. I’m confused. Isn’t this the exact same plan that was proposed? I thought the banks accepted the money only until their financial situation strengthened, at which time they would repay the government. This quarter, the banks will report “blow-away” profits. Their strength has returned! The bankers also were not told of important caveats that would occur while they held the government’s money. Each of these learned and brilliant bankers would be called to Washington and berated by a bunch of uninformed and almost unintelligible politicians. They would have the Federal government intervene in almost every aspect of their business. Even though many of the banks did not want the government’s money in the first place, the involvement of the government in their business became mandatory. I hope everyone realizes that the government is basically attempting to interject itself in privately owned businesses. These banks are owned by their shareholders, not by the government. Hopefully many of the banks will repay the debts in the coming weeks and we will once and for all end this nasty intervention by government in businesses they have no clue about running. Do you recall when the new stimulus bill was being debated that these projects would quickly put money into the U.S. economy? In fact, the website, www.Recovery.gov, so boldly said that it will “save or create good jobs immediately.” In fact, the White House economists in January predicted that unemployment would top out at 8% if the stimulus bill was passed. Of course, the government tends to exaggerate and then the facts get lost in time. In fact, as of today, only $44 billion of the $787 billion in stimulus money has actually been spent. It should also be evident that $44 billion in spent stimulus money in an economy that exceeds $14 trillion is literally a drop in the bucket. If anyone thinks that this $44 billion had any material effect on the excellent job report we had on Friday, then they really do not understand the scope and scale of the excellent U.S. economy. Remember the White House’s promise that unemployment would top out at 8%? In fact, unemployment hit 9.4% on Friday, which is a 25-year high. I reviewed the unemployment records and discovered that 1.5 million jobs have been lost in America since the stimulus package was instituted. Apparently, spending the stimulus money has not been nearly as easy as we were led to believe. It has been a slow, grinding bureaucratic mess with almost no positive results. In fact, many of the stimulus packages are bogged down in lawsuits and counter charges. In many cases, none of the stimulus money has actually been spent in some states. However, the economy and the stock market continue to improve without it. Learned politicians (an oxymoron?) would quickly evaluate this positive economic trend and revalue the entire stimulus package. Rather than create unprecedented deficits in this country over the next two years, it is now time that half of the stimulus package that was previously approved be immediately repealed. It is not needed, and in the end, it will cause more problems than it will be worth. Everyone seems to have lost sight of the fact that the Federal deficit for 2008 was roughly $455 billion. That’s large for sure, but it’s peanuts compared to 2009’s deficit, which is a staggering $1.8 trillion. The economy was never as bad as the press tried to lead you to believe, but we have opened the door to massive government spending at unprecedented levels that we have never seen in the past. In addition, we have opened up private industry and small businesses to be run by the bureaucrats in Washington who are clueless as to how to run our government, much less private industry where few of them have ever worked. If you need some examples of how private industry no longer needs the government’s involvement, here are a few: Last week, none of the major investment houses borrowed any money from the Federal Reserve. In fact, the last time they borrowed money from the Federal Reserve was the week of May 13th, almost one month ago. Since the large investment houses were able to raise capital easily in the public market, the involvement of the Federal government in bailing them out is no longer necessary. The banks and investment houses have raised $80 billion in private money in the last two months. You may have recalled my earlier statements that the government would provide a much needed fund to handle commercial paper of large companies. When the banks suddenly quit loaning short-term money, the government stepped up and provided the liquidity that was needed for short-term commercial paper. The Federal Reserve identified $1.3 trillion worth of big business commercial paper that they were willing to purchase to assist the U.S. economy. But once again, politicians screamed that the government was bailing out businesses that deserved to fail. I guess they never bothered to read the whole story. In fact, demand from private businesses for this program in commercial paper never came. Perhaps it was because the businesses were able to borrow their own money or banks actually started providing the necessary financing. However, as of last week, the Federal Reserve was only holding $145 billion in corporate commercial paper. In each week of the last six, this amount has been going down. Since most commercial paper matures over a relatively short period of time, as the maturity dates are reached, the Federal government will be repaid the principal plus interest and these amounts will continue to go down. While $145 billion is a lot of money, it is nowhere close to the $1.3 trillion that was originally proposed. In order to fund these massive government programs – which the economy no longer needs – the government is proposing every type of new tax ever attempted in any country in the world. There’s a new proposal on the table that U.S. based corporations will be taxed based upon their foreign income in the United States. The fact that companies can presently set up corporations in a foreign country with low income workers and run and fund them economically from the United States without taxation has put literally millions of people to work in foreign countries with U.S. employers. On Wednesday of last week, Microsoft’s CEO, Steve Ballmer, indicated that if such a tax was imposed, it would reduce the earnings of the Dow Industrial companies by 15%. Microsoft is arguably the most important U.S. company with 90% of the PC market. Ballmer stressed that it will benefit all U.S. corporations to export jobs if this proposed tax passes. Given a normal multiple of 10 times earnings, we are talking about an astronomical sum of lost wealth by all Americans. Even scarier is that companies will not do business in the United States due to this unfair and unrealistic corporate tax. U.S. based companies will also relocate out of the United States to countries with friendlier tax laws. Once again, the idea of increasing taxes to pay for unneeded and unwanted social programs in this country will hurt the very employees the social plans are designed to assist. By increasing taxes on businesses, businesses will employ fewer people. If these American companies relocate to foreign countries, then the jobs will benefit foreigners in other countries, not individuals in the U.S. There are other taxes that have also been proposed. You can call it whatever you want, but the new Cap-and-Trade Program is nothing more than a way to extract money from the economy under the misguided theory that it will help the environment. We’re now even hearing about a possible VAT (Value Added Tax) European-style tax of 10%. This would essentially be a national sales tax in addition to all the other taxes you currently pay. Furthermore, I continue to read about the possibility of a health care tax to fund the massive undertaking of government-sponsored health care in the United States. Again, title them however you want, but when you take money out of an individual’s pocket and give it to the government, it is a tax. As the government involves itself in the daily aspects of running American businesses, the burden on U.S. taxpayers will only increase. You may say that this will only impact the rich, but all the taxes outlined above affect the poor proportionally. The poor will need to continue to purchase utility services which will go up under the Cap-and-Trade Program. Everything purchased will be impacted by a VAT. All people needing health care will pay extra taxes to fund a larger bureaucratic nightmare that government-sponsored health care will bring. In fact, every plan proposed will come with new massive governmental spending and corresponding massive government taxes. There are solutions that should be pondered: The rest of the stimulus package beyond fiscal 2009 should be trashed. It’s not needed, it’s not good for the economy, and we certainly cannot afford it. Rather than increase taxes, the government needs to reduce spending. If there is any type of fiscal responsibility in Washington, the budget has an outside chance of being balanced in the next decade. The largest single increase in employees in the latest employment numbers is in the government. The government needs to be cutting employees rather than increasing them. The future of a better economy and a better way of life for employees is through private employment, not the government sector. It is encouraging to see the stock market go up 12 of the last 13 weeks. It is encouraging to see the number of people filing for unemployment fall. It is encouraging that the banks and investment houses say they don’t need the government’s money any longer. It was only eight months ago that Congress was telling everyone the $700 billion bailout bill for the banks would amount to zero to the taxpayer in return. In fact, only $350 billion of the original bailout bill was used, and the government has received interest on every dime. In the next two weeks, half of that is subject to being repaid. There is so much good going on that it’s hard for the public to believe since they do not get a report of that in their daily news. The only place you see better news on the horizon is on Wall Street. As always, the above are my comments and opinions. Heaven knows, I could be wrong. Dollar Rallies - The U.S. dollar has been rallying since Friday against its foreign currency rivals. The British pound is being hit due to political pressure against British Prime Minister Gordon Brown and his ability to be reelected later this year. The Monday low for the pound was $1.5802 versus $1.5981 on Friday. The euro is falling due to S&P lowering the credit rating to Ireland from AA+ to AA. The Monday low for the euro was $1.3803 versus $1.3968 on Friday. Gold Falls as Dollar Rallies - Gold futures declined this morning for a second straight session. Gold fell below $950 an ounce for the first time in more than two weeks as the U.S. dollar continued to strengthen against other foreign currencies curbing gold's investment appeal. Gold fell $17.20 (-1.8%) to $944.50 an ounce. This is the first time gold has been below $950 since May 21. SunTrust Closes Stock Offering - SunTrust Banks on Monday said it had completed a previously announced common stock offering and other moves that bring the company's capital ratios in-line with the stress tests conducted by the government. SunTrust sold 124.3 million shares of common stock and raised $1.56 billion in new capital. "The positive reaction to our stock offering underscores what we believe to be the market's confidence in SunTrust, our strategies and, especially, our post-recession growth prospects," said SunTrust CEO James Wells in a press release. Final Capital Raising Plans for Nine Large Banks Due Monday - By Ronald D. Orol - MarketWatch - "A group of nine large financial institutions must provide capital-raising and governance plans Monday, the same day that another group of mega-financial institutions is likely to be given the go-ahead to repay billions of dollars in government money." Obama's Health Cost Illusion - The Wall Street Journal - "The main White House argument for health-care reform goes something like this: If we spend now on a hugely expensive new insurance program for the middle class, we can save later by reducing overall U.S. health spending. This 'tastes great, less filling' theory could stand some scrutiny, not least because it is being used to rush through the greatest social spending program in American history." Merkel Makes a Mark - By Bertrand Benoit - Financial Times - "When Angela Merkel ended a long and otherwise unremarkable speech about economic policy this week with a vitriolic attack on the world’s three mightiest central banks, the German chancellor was writing a minor chapter of her country’s political history." Congress, the Banks and Derivatives - The New York Times - "The Obama administration has made a serious proposal to regulate derivatives — the multitrillion-dollar market in financial contracts that malfunctioned so disastrously last year. The plan goes further than many thought politically possible, especially in its call for federal oversight of all large derivatives dealers. But it does not go far enough." Paying for Universal Health Coverage - The New York Times - "For Congress and the administration to keep the promise of comprehensive health care reform, they will have to find the political will to pay for universal coverage and other investments that are needed right away but will not produce quick savings. The cost could reach $1.5 trillion over the next decade." The Only Statue That Is Smiling - By Peggy Noonan - The Wall Street Journal - "Ronald Reagan, cast in bronze, arrives at the Rotunda... Rather than recite a history lesson, he said, he'd note that in the 1980s, when the world said America was over, America said not quite, and when they said freedom was yesterday, America said I don't think so." Today marks the 65th anniversary of D-Day. On June 6, 1944, 156,000 Allied soldiers from the U.S., Britain, and Canada fought through rough seas, vast minefields, and waves of machine gun fire to start to claim a little piece of land called Normandy. From that one foothold, the military offensive that retook France sprung forth. Just a few editorials and sites today remembering this day and how it changed the world. Sacrifice and the Greatest Generation - By Tom Brokaw - The Wall Street Journal - "These are the young Americans who went thousands of miles and defeated the mightiest military empires ever unleashed against us." Of War and Remembrance: The World Recalls Valiant Invasion of the Nazi Empire 65 Years Ago - New York Daily News - "American boys went ashore in the biggest amphibious invasion of all time, far too many of them surrendering their blood and their lives in the cold surf and on sand cruel for its lack of cover. But forward they went, these members of the Greatest Generation, in courageous assault on tyranny's fortress. And, of course, they prevailed - saving nothing less than civilization itself." 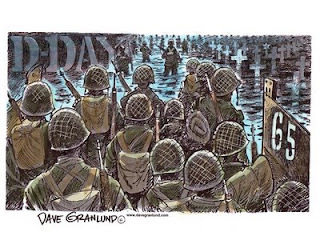 D-Day Anniversary: Britain's Good War - The Guardian (England) - "The allied invasion of occupied France which began on the Normandy beaches in the grey light of dawn 65 years ago today was not the turning point of world war two. That accolade belongs to the battlefield exploits of the Red Army, which also bore the brunt of the conflict for longer and killed four times as many German soldiers as the rest of the allies put together. Nevertheless, D-day was seen at the time, and has rightly been seen ever since, as a defining moment in the war and in shaping the postwar world." Normandy American Cemetery and Memorial - American St. Laurent Cemetery, France - "The Normandy American Cemetery and Memorial in France is located on the site of the temporary American St. Laurent Cemetery, established by the U.S. First Army on June 8, 1944 and the first American cemetery on European soil in World War II. The cemetery site, at the north end of its ½ mile access road, covers 172.5 acres and contains the graves of 9,387 of our military dead, most of whom lost their lives in the D-Day landings and ensuing operations. On the Walls of the Missing in a semicircular garden on the east side of the memorial are inscribed 1,557 names. Rosettes mark the names of those since recovered and identified." The National D-Day Memorial Foundation - Bedford, Virginia - "Imagine a place where the lessons and legacy of D-Day are remembered and preserved, a place where veterans of all ages are welcomed and honored, a place where visitors discover and recognize the worthy service of those who answer duty’s call, a place where gravity and dignity are hallmarks. The National D-Day Memorial is such a place." Payrolls Fall Less Than Expected, Hourly Earnings Rise - Now, the headline number will be that the unemployment rate jumped to a 26-year high of 9.4% in May, but the big item looking forward (and not back as the unemployment rate does) is that 345,000 payroll jobs were lost in May compared to the 500,000 that had been expected. Average hourly earnings rose by 2 cents, or 0.1%, to $18.54. Over the previous six month, there had been an average loss of 643,000 jobs. Payrolls in March and April were revised higher by 82,000. The payroll figures from a survey of business sites was much better than expected, a separate survey of households showed unemployment increased more than expected. Officially, unemployment rose by 787,000 in the month to 14.5 million, pushing the jobless rate from 8.9% to 9.4% which is the highest since August 1983. In a separate survey of households, the government found that employment fell by 437,000. While unemployment rose by 787,000 to 14.5 million, the data showed that 350,000 people joined the workforce last month. The number of people who've been out of work longer than six months rose by 268,000 to stand at 3.9 million. Representing 2.5% of the workforce, this figure marks the highest seen since 1983. Rio Tinto Jumps - Rio Tinto shares shot up 14.4% on the new that the Anglo-Australian mining giant said that it decided to reject a $19.5 billion deal to sell part of itself to China's Aluminium Corp. and announced the launch of a heavily discounted rights issue to raise about $15.2 billion in gross proceeds. The company also announced that it's in a deal with BHP Billiton to establish a production joint venture that will cover both of the companies' Western Australian iron-ore assets. BHP Billiton shares rose 10.6% in response. FDIC Looks to Change Citi Management - The FDIC is pushing to change Citigroup's management, and they may be starting at the top which would threaten the future of Chief Executive Vikram Pandit, The Wall Street Journal reported, citing people familiar with the matter. Officials at the FDIC have been concerned about the lack of senior executives with experience in commercial banking, and Pandit comes from an investment-banking background, The Journal said Friday. The Journal quoted Ned Kelly, Citi's chief financial officer, as responding: "The FDIC is our tertiary regulator," implying that any decision about the bank's fate would first have to be addressed by the Office of the Comptroller of the Currency or the Federal Reserve. This is just more fuel to the fire to somehow streamline the regulatory procedures with someone being the ultimate regulator. Oil, Copper Up, Treasurys, Gold, Silver Down on Jobs Data - Oil and copper futures rose Friday after the government data showed the U.S. lost much fewer jobs last month than expected. After data, oil broke through the $70 a barrel barrier and rose 1.7% while copper for July delivery rose 0.7% to $2.318 a pound. Meanwhile, Treasury prices plunged sending yields to their highest point since November 2008. Additionally, gold fell 0.4% to $977.60 an ounce and silver lost 1.5% to $15.66 an ounce. Fed Buys Treasurys - The Federal Reserve Bank bought $7.494 billion in Treasurys maturing between 2011 and 2012 on Thursday, the second operation this week and the latest in the central bank's attempts to keep a lid on borrowing costs and spur economic activity. Dealers offered $36.628 billion to be purchased. The last three times the Fed bought from this maturity range, it purchased about $7.3 billion. Continuing Claims Fall, Productivity Rises - After reaching new weekly record highs since January, the number of continuing claims for state unemployment benefits has started to decline. The Labor Department reported a decrease of 15,000 to 6.74 million in the week ended May 23. First-time applications for benefits fell 4,000 to 621,000 in the week ended May 30, reaching the lowest level since early May. Additionally, the Labor Department report that productivity rose 1.6% in the first quarter as U.S. firms cut their workforces, outpacing the drop in output. An earlier estimate by the Labor Department had been for a 0.8% advance. 30 Year Mortgage Rates Jump - The 30-year fixed-rate mortgage averaged 5.29% for the week ending June 4, up from last week's 4.91% average. The mortgage averaged 6.09% a year ago. Foreign Banks Keep Rates Unchanged - The Bank of England (BOE), Bank of Canada (BOC), and the European Central Bank (ECB) each decided to keep interest rates unchanged. Bernanke on the Hill - Federal Reserve Chairman Ben Bernanke told Congress Wednesday that a gradual recovery remains on track for this year, and inflation would remain low given the slow pace of recovery. "The recent data also suggest that the pace of economic contraction may be slowing," Bernanke said in a cautiously optimistic scenario. He said a technical end of the recession could occur later this year. Economic items that Bernanke pointed to included consumer spending that has been flat since the turn of the year, activity in the housing market that has shown some signs of bottoming, companies that are continuing to lower inventories, and that in turn should spur production in the coming months. "We continue to expect overall economic growth to bottom out and then turn up later this year," Bernanke said. "The recovery will only gradually gain momentum and...economic slack will diminish slowly." As we have discussed many times in this blog that unemployment is one of the slowest lagging indicators, Bernanke said that the future points to "sizable job losses and further increases in unemployment" over the next few months. ADP Employment Services said private companies slashed 532,000 jobs in May, after a downwardly revised 545,000-job drop in April. The private-payroll report was only slightly weaker than some economists had predicted and comes two days before the government's closely watched monthly employment report. The Institute for Supply Management said the non-manufacturing sector contracted at a slower pace in May, but didn't improve as much as economists had anticipated. The ISM nonmanufacturing index rose to 44% from 43.7% in April. Economists were expecting an increase to 46%. The Commerce Department reported that factory orders rose 0.7% in April. Excluding transportation, factory orders climbed by 0.1% in the month. Shipments, meanwhile, fell by 0.2% in April. Inventories on Oil, Gas Send Futures Lower - U.S. commercial crude inventories rose by 2.9 million barrels last week as reported by the EIA, while analysts surveyed by Platts had expected a decline of 2 million barrels. Additionally, the EIA reported that total motor gasoline inventories decreased by 200,000 barrels last week, much less than the drop of 1.5 million barrels that had been forecast. Crude oil futures dropped 2% to around $67 per barrel on the news. Editorials everywhere today about GM and its bankruptcy and a few are included in today's post. Pending Home Sales Up for Third Straight Month - Pending sales of existing homes were up for the third month in a row in April boosted by record-low mortgage rates and special incentives for first-time buyers the National Association of Realtors (NAR) reported Tuesday. The pending home sales index for April rose 6.7% after a 3.2% increase in March. The index based on sales contracts on existing homes was 3.2% above April 2008. Combine SEC and CFTC? - SEC Chairwoman Mary Schapiro testified before a Senate Appropriations subcommittee on Tuesday about combining the Securities and Exchange Commission and the Commodities Futures Trading Commission. She said, "There is a logic and efficiency that can be achieved through a merger of the two agencies, but short of that we can work together effectively." How GM Lost Its Way - The Wall Street Journal - "Decades of dumb decisions helped send General Motors to a bankruptcy court yesterday, but one stands out." The Quagmire Ahead - By David Brooks - The New York Times - "On Jan. 21, 1988, a General Motors executive named Elmer Johnson wrote a brave and prophetic memo. Its main point was contained in this sentence: 'We have vastly underestimated how deeply ingrained are the organizational and cultural rigidities that hamper our ability to execute.'" How Washington Blew GM’s Bankruptcy - By Michael Levine - Financial Times - "As General Motors finally filed for bankruptcy on Monday, some critics of the move have already made the case that Congress, not a White House task force, should have planned the bankruptcy. They are right about one thing: a White House task force should not have planned the bankruptcy. But they are 180 degrees wrong about what the government should have done. 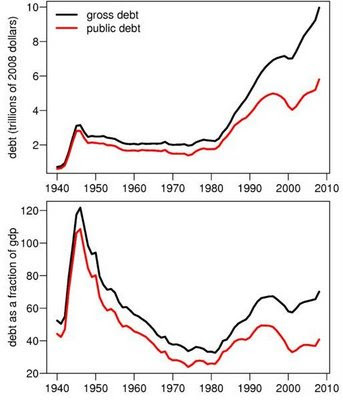 The bankruptcy needed much less “public policy” input, not more." As GM Goes So Goes California in Pensions - By Roger Lowenstein - Bloomberg - "Did pension debts ruin General Motors? I said they did in While America Aged, a book published last year. The thesis was that many decades of inflated pension and health-care benefits forced the company to redirect its free cash flow to retired workers. As a result, there was little or nothing left for the shareholders." General Motors Files for Bankruptcy - GM filed for bankruptcy Monday morning after months of the company and government tried to avoid it. At the same time, GM (and Citigroup) was being removed from the Dow 30. In the bankruptcy filing, the company reported total assets of $82.3 billion on a consolidated basis with total debt of $172.8 billion. "Today marks a defining moment in the reinvention of GM as a leaner, more customer-focused, and more cost-competitive company that, above all, can quickly generate winning bottom line results," CEO Fritz Henderson said. "The economic crisis has caused enormous disruption in the auto industry, but with it has come the opportunity for us to reinvent our business. We are going to do it once and do it right." The government's stake in the new GM will be about 60%, and it hopes bankruptcy will be a quick 60-90 day process. The U.S. government will provide $30 billion in bankruptcy financing to allow the company to operate as it restructures $27 billion debt and pension liabilities. Changes in the Dow 30 Index - What is the most recent change in the financial markets? Changes in the Dow... According to The Wall Street Journal, GM and Citigroup are being removed by Dow Jones. The replacements, which will be effective June 8, will be Cisco Systems for GM and Travelers for Citigroup. Construction Spending Up Thanks to Home Improvements - Construction spending rose 0.8% in April, the biggest gain since August, as outlays for home improvements grew, the Commerce Department reported Monday. Spending on private-sector residential projects increased 0.7% as home improvements rose 8.9%. Outlays for new construction on single-family homes fell 6.7%, the 38th consecutive decline. Outlays for private-sector non-residential projects rose 1.8%, led by power, manufacturing and communications structures. Outlays for public-sector projects fell 0.6%. Manufacturing Sees Improvements - The Institute for Supply Management index rose to 42.8% in May from 40.1% in April. The 42.8% is its highest reading since September 2008. Copper Rises to Seven Month High - Copper futures climbed to their highest level in more than seven months after China, the biggest copper consumer, reported its May manufacturing expanded for a third month. Two competing purchasing-manager indexes released Monday showed Chinese factory activity remained on an uptrend in May. Personal Savings Rate Increases - The US personal savings rate increased to a 14-year high of 5.7% in April as after-tax incomes were boosted by provisions of the economic stimulus plan the Commerce Department reported Monday. Court Clears Fiat Deal for Chrysler - Chrysler said Monday that a federal bankruptcy court has approved its request to sell its operations to Chrysler Group LLC, the new company formed in alliance with Italy's Fiat SpA. The revamped Chrysler could exit bankruptcy as soon as Monday after Judge Arthur Gonzalez of the U.S. Bankruptcy Court for the Southern District of New York cleared a $2 billion transaction in connection with the deal. "With this approval, the new Chrysler Group is created and can prepare to launch as a vibrant new company formed with Fiat," said Robert Nardelli, chairman and chief executive of Chrysler LLC, in a statement.